Firstly I apologise for disappearing. In short I’ve been planning to move abroad and the logistics have been a nightmare so I’ve had less time to commit to great beer these past few months. I am alive and drinking though so please stay tuned for more regular updates. Alesmith! Right, Alesmith. 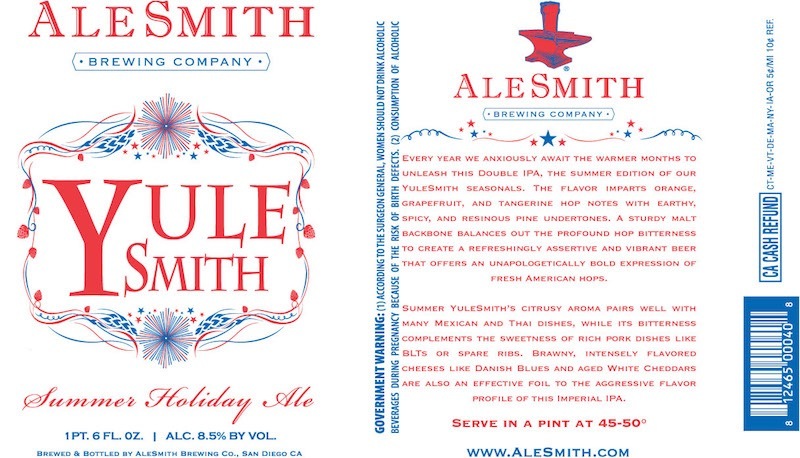 This lovely San Diego brewery comes out with festive holiday brews every winter and summer season but I’m not familiar with their limited edition beers at all. I picked up this year’s summer sale on a whim and it turned out to be a beautiful, crisp brew with apple flavours. It’s a fairly pale golden ale categorized as a double IPA but features more sweet and rich malt flavours that many of its IPA cousins. Summery citrus notes were my first impression but there’s also some spice and piney flavours that complement the sweet malt flavour really well. Some very Californian grapefruit notes come through but they don’t eclipse the unexpected tropical fruit eaters in the mix. The robust ABV doesn’t really feature in the taste. It’s both a crisp, refreshing ale and an interesting beer with complex notes that you just won’t find in a summer lager. If this is available near you I’d definitely recommend it.